Interviewing Jamie Lee Curtis is almost as terrifying as her new film. The 60-year-old is someone who will give you a totally unvarnished opinion on any given subject – even when it comes to the questionable quality of some of her previous movies. The actress is speaking to BBC News about her return to Halloween – a series of films we can strongly advise you not to refer to as a franchise in front of her. “OK, let me remind you of something,” she begins. “Halloween was made in 1978. There was no franchise. It wasn’t a franchise. And it isn’t a franchise. It is a series of films. She may shy away from the franchise label, but there’s no getting away from the fact that this is now the 11th instalment of the series. The 40 years which have passed since the original have seen a mixture of sequels, reboots and remakes released. The fact that Curtis has chosen to return to play Laurie Strode, however, is presumably what gives the new one some credibility. “The real stamp of approval is John Carpenter’s, not mine,” she says, referring to the director of the original, who has returned as the composer and executive producer of this one. “Because I made a couple of [rubbish] ones,” she says, using a rather stronger word than that. We look surprised at this assertion – as it’s rare to hear an actor criticise their own films so openly. Curtis, in turn, is surprised by our surprise. Reviews for the newest instalment of Halloween have been mixed – although several critics concede it’s the best one for some time. “A new coat of paint, even on a storied house of horrors such as Halloween, can do wonders,” said USA Today. 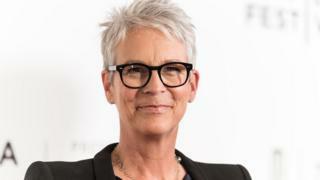 Forbes added: “You’re probably here for Jamie Lee Curtis reprising the role that made her a star. She’s terrific, which is not a surprise since she has always been an excellent actress. Carpenter’s endorsement may indeed, as Curtis suggests, persuade moviegoers to give the new film a chance, but many will still be sceptical about whether it really offers anything new. “I don’t care,” Curtis replies. “What can I do? I’m not going to try to dissuade someone from a feeling. There have been some terrible movies made, I understand that. Which is all very well and good, but why return to such a familiar brand? And why now? Surely it would be preferable for a producer to send her a script for a brilliant new horror film, rather than trying to get her to revisit her previous successes. “Yeah, but they’re not going to, I’m 60 years old,” she says. “They’re not going to come to me with a new idea for something at 60. “It’s not impossible, it’s unlikely. You know what? I’ve been an unemployed actor for the great part of my career. “Honestly, if you boiled down how many days I have been employed as an actor, compared to how many days I’ve been unemployed as an actor, it would shock you. It would turn your hair grey. Because I’m a freelance up-for-grabs unemployed actor, today. Warming to her theme, she points out that returning to Halloween is precisely why there is interest in this movie in the first place – which wouldn’t necessarily be there without it being part of the series. “With all of the films I’ve made, all the TV shows I’ve done, I’ve never had the level of attention I’ve had for this movie, in every aspect, magazines, radio, European tour, jets, flying around the world,” she explains. Fresh from the German premiere on the day we speak, Curtis’s UK interviews for the film are taking place in central London. The actress says sometimes British journalists do ask if they should refer to her as Baroness Haden-Guest, a title to which she says she would answer. Her husband, the British screenwriter and director Christopher Guest, inherited his peerage in 1996 – but a change in the law meant he wasn’t able to participate in the House of Lords for long. “The thing about something that has been inherited is that it’s connected to the loss of somebody. So you see my husband inherited his title from his father when he died, so for me it’s always just a reminder that his Dad’s not here,” Curtis explains. Shortly after Lord Haden-Guest became a peer, Tony Blair was elected prime minster on a manifesto which abolished hereditary peerages. The House of Lords Act 1999 meant most peers who had inherited their titles could no longer sit or vote – a policy, Curtis says, “which both my husband and I agreed with”. The Weatherill amendment meant 92 of the 750 hereditary peers were allowed to retain their seat – but Lord Guest was one of those who did not. “The irony and sad part of it for me, is that the reason that they wanted to abolish hereditary peers is that so many of them didn’t participate. They used it for the reasons that make it silly,” Curtis says. “And the truth is that my husband is an intellectual, he reads eight newspapers a day, he’s an environmentalist, he’s a very serious, intelligent man, and he would’ve been a great participant in the process. Strictly fans pay £26 for a judge selfie but what do other celebrities charge?